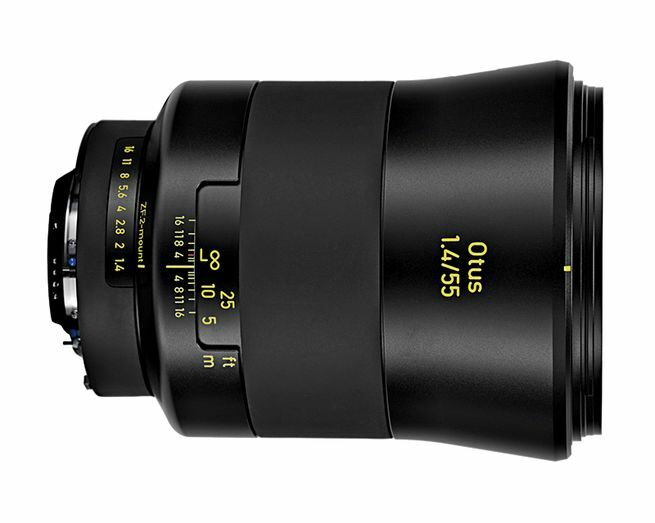 The launching into market of the formidable manual focusing Zeiss Otus 55 mm f/1.4 Apo-Distagon T* on October 7, 2013 meant a milestone in both the design and manufacture of 50/55 mm f/1.4 standard lenses worldwide, becoming the benchmark of quality in its scope until the introduction of the also formidable Leica Summilux-SL 50 mm f/1.4 ASPH Autofocus in September 2017, which has been the yardstick since then, thanks to its operation with an exceedingly fast and accurate AF system enabling it to work handheld at a much higher speed and with a superior rate of huge quality results, because to be able to get maximum focusing precision is a key factor to try to draw as much potential as possible of the extraordinary Zeiss Otus 55 mm f/1.4 Apo-Distagon T*. 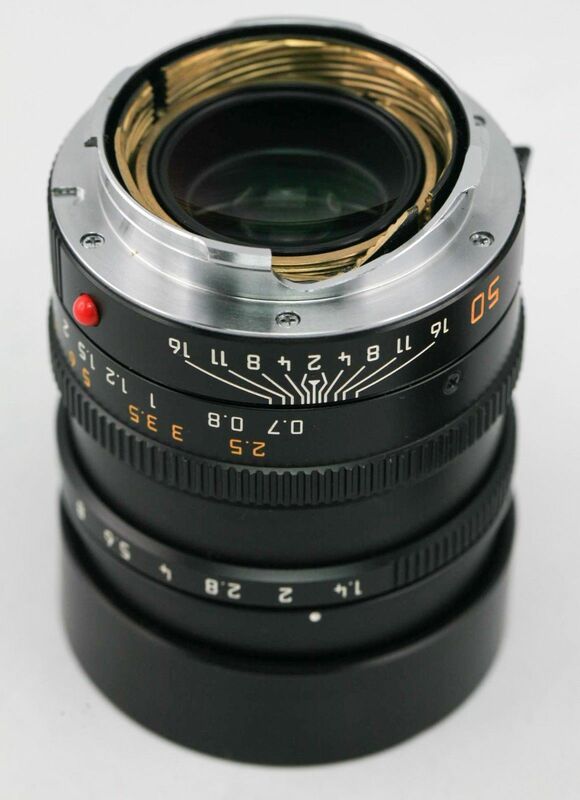 Obviously, only the Summilux-SL 50 mm f/1.4 ASPH can nowadays rival with it (outperforming it shooting hand and wrist, because under controlled conditions with the camera on a tripod, particularly within studio, things are pretty even, with the Zeiss Otus 55 mm f/1.4 Apo-Distagon T * being in my opinion slightly better from an overall viewpoint in photographic environments where it is possible to make things quietly and to take one´s time to manually focus with accuracy). 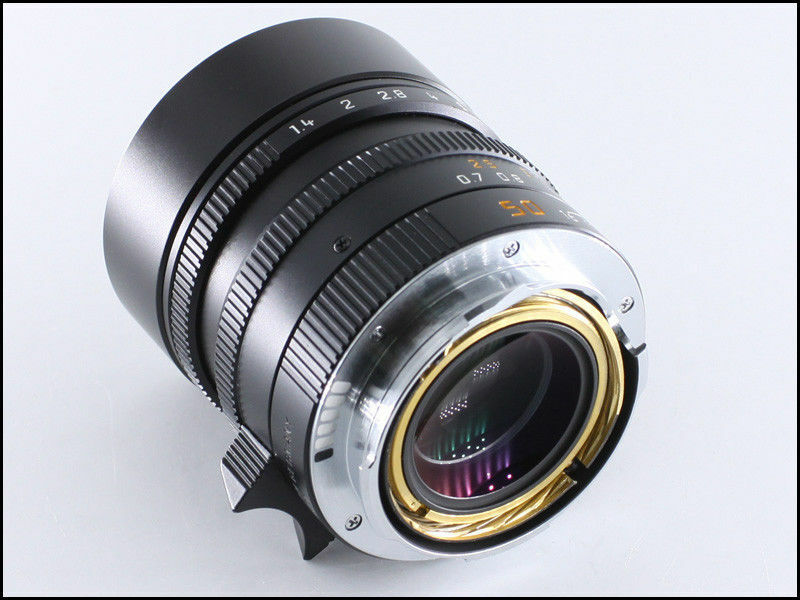 Thus, inevitably, a question arises: How can an extraordinary lens like the Summilux-M 50 mm f/1.4 ASPH engage in a duel with a stratopsheric lens like the Zeiss Otus 55 mm f/1.4 Apo-Distagon T* being clearly superior in virtually every aspect related to image quality achieved and mechanical construction ? 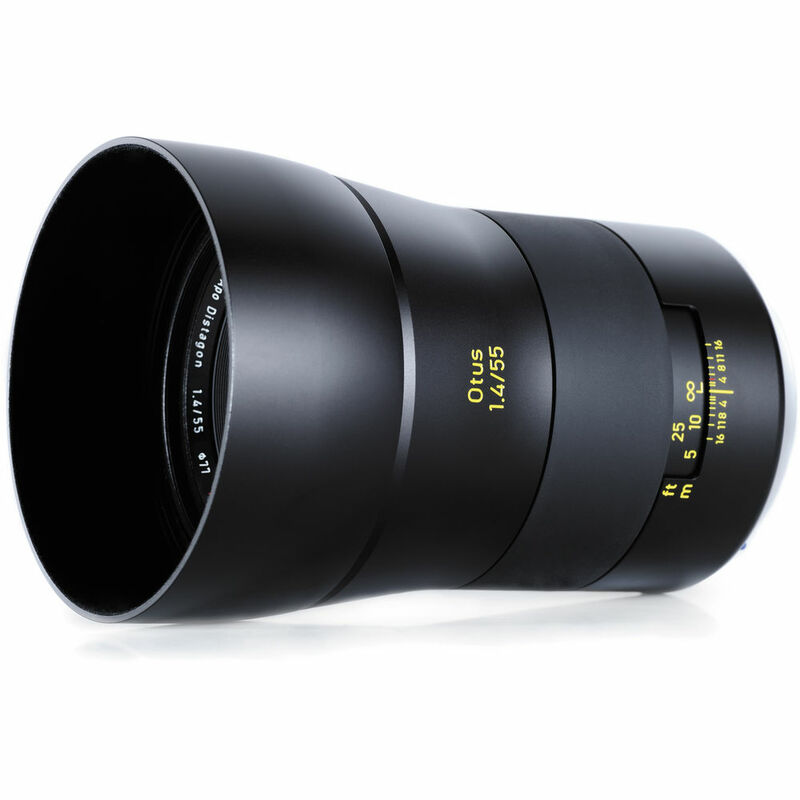 Evidently, the 12 elements (one of them being aspherical, together with six more featuring very special optical glass with anomalous partial dispersion) in 10 groups Zeiss Otus 55 mm f/1.4 Apo-Distagon T* is also more advanced from an evolutive standpoint (something understandable, since the Summilux-M 50 mm f/1.4 ASPH was launched into market in 2004 and the Zeiss Otus 50 mm f/1.4 Apo-Distagon T* in late 2013, and nine years are a whole world in the technological and optical realms at the highest level). 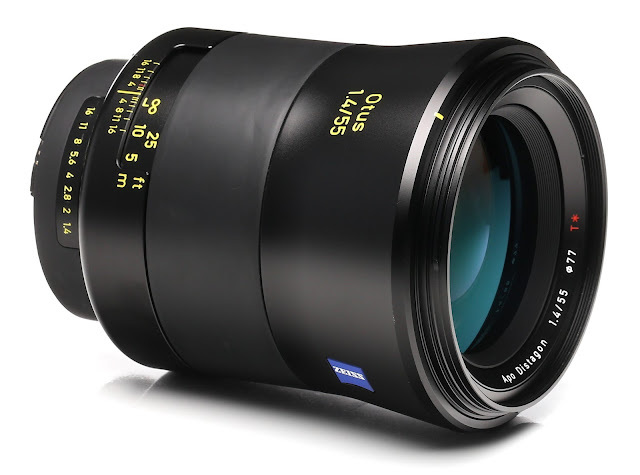 a) The Zeiss Otus 55 mm f/1.4 Apo-Distagon T* was designed with no compromise whatsoever regarding size and weight (141 mm length x 92 mm diameter, with a weight of 1030 g in ZE mount for Canon EOS and 970 g in ZF.2 mount for Nikon F), so shots with accurate focus on photographing handheld (specially in the range 1/15 s-1/125 s) are much more difficult to attain with the Zeiss Otus 55 mm f/1.4 than with the Summilux-M 50 mm f/1.4 ASPH (whose weight is 335 g, that´s to say, almost three times lighter than the Otus) and besides, the Otus 55 1.4 will be front heavy when connected to any camera, because of its huge weight and dimensions. 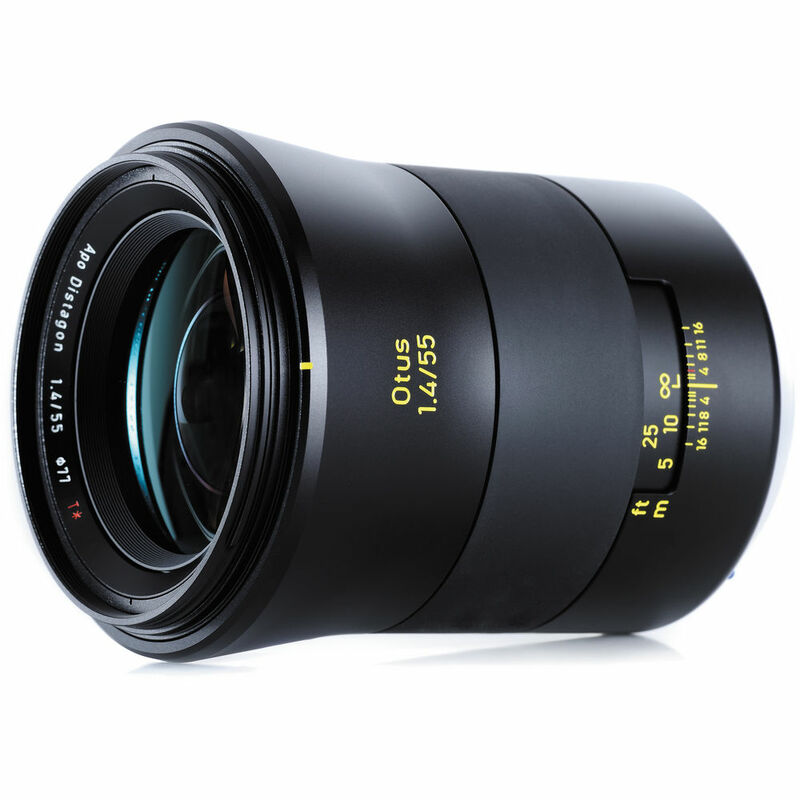 On the other hand, though being apparent that the Summilux-M 50 mm f/1.4 ASPH is a non retrofocus design making possible its deep insertion in the camera body, with its most rear element located very near the digital sensor (as well as enabling to reduce the number of optical elements and groups) unlike the Zeiss Otus 55 mm f/1.4 Apo-Distagon T* which is a retrofocus design having to save the ascending movement of the reflex mirror, it shouldn´t be forgotten that the most difficult task by far for any optical designer when tackling striving after creating a high optomechanical quality lens is the combination of small size and weight, because every software of optical designing (including the most advanced ones handled by Leica and Zeiss) will steadily beget a very large and heavy lens from the very moment in which parameters of excellent image quality are introduced, and hugely big and heavy if those parameters aim at getting a stratospheric optical performance. 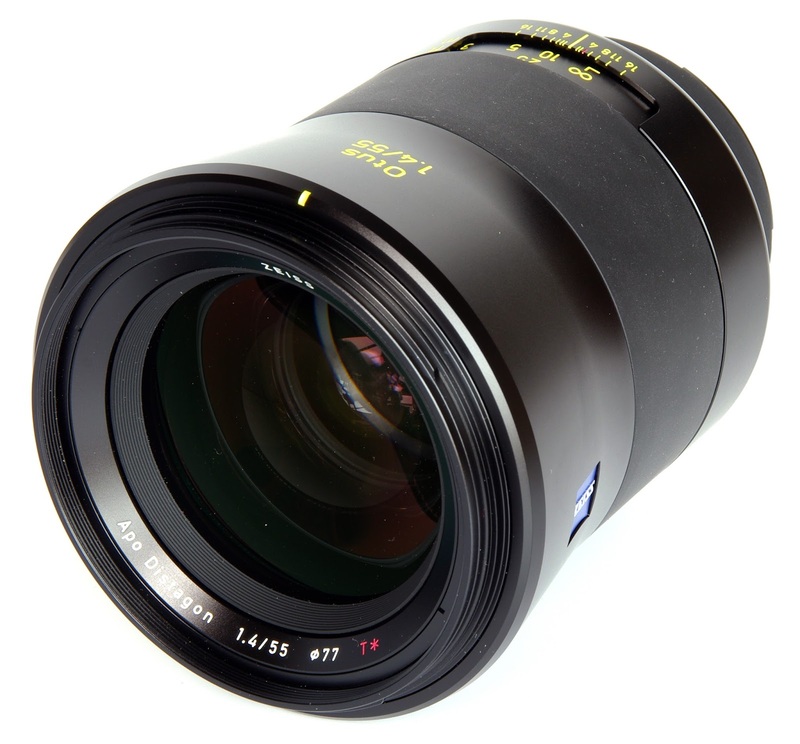 b) The Zeiss Otus 55 mm f/1.4 Apo-Distagon T* includes DNA of the highly successful and proved 2 1/4 x 2 1/4 (6 x 6 cm) Carl Zeiss Distagon medium format optical scheme, whose entrance pupil is much smaller than the exit one. Id est, it is a very brilliant adaptation of an optical formula mostly used with wideangle lenses, optimizing its optical performance to be used with full frame 24 x 36 mm format professional reflex cameras Canon and Nikon, particularly with the Nikon D800E, whose top-notch sensor needs first-rate lenses to be able to tap its full potential, which is surpassed even at f/1.4 in borders and corners by this reference-class lens having become a landmark on its own merits. That´s why its extraordinary bokeh boasts such a great smoothness and subtlety (typical of the medium format, with the peculiarity that though within a standard lens perspective, it resembles the out of focus rendering generated by a 85 mm or 90 mm lens, enhanced by its painstakingly built 9 blade diaphragm) unbeatable in the 24 x 36 mm domain (although the likewise extraordinary bokeh generated by the Leica Summilux-SL 50 mm f/1.4 ASPH being strongly inspired by the Noctilux-M 50 mm f/1 designed by Walter Mandler in 1975 is not far behind), in the same way as happens with its truly praiseworthy correction of optical aberrations, its wonderful exquisiteness depicting the tonal gradations, the tridimensional quality in the look of the images it yields and the swift transition between focused and unfocused areas, without forgetting his tremendous resolving power based on a reference-class true apochromatic design. 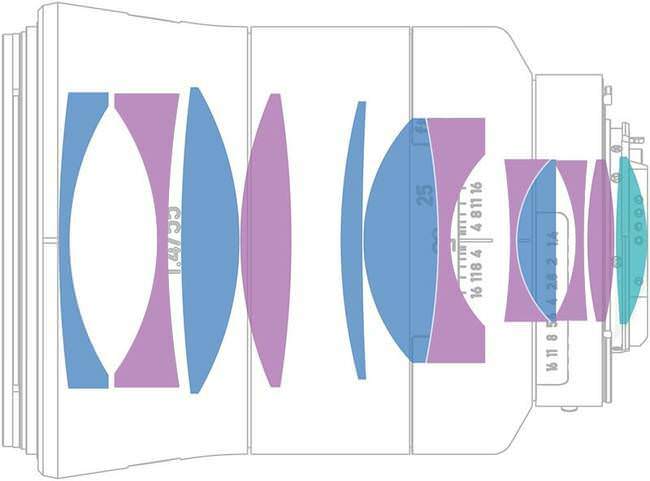 c) It must also be added that the unrestricted design of the Zeiss Otus 55 mm f/1.4 Apo-Distagon T* regarding its size and weight has also enabled the genesis of a telecentric behaviour (with the exit pupil being farther from the sensor surface, so the light beams reach it in a more perpendicular way, so minimizing the artifacts of microlenses, in addition to reducing the vignetting) in the five elements of the rear telephoto optical group, of which the nearest to the 24 x 36 mm sensor is the state-of-the-art double side aspheric element, by far the most important one to get the yardstick image quality delivered by this lens, in synergy with its likewise incredible control of flare and coma, along with its extraordinary multicoating in the aforementioned rear elements making them less sensitive to the reflections coming from the bright digital sensors. d) The standard viewfinders of the currently best digital full frame Canon and Nikon cameras are far from reaching the qualitative level (as to viewing sharpness and easy and quick focusing accuracy) of professional analogue 24 x 36 mm format cameras like the Olympus OM-1, Nikon F2, Canon F1 New, Leica R6, etc, so any photographer using the Zeiss Otus 55 mm f/1.4 Distagon T* lens shooting handheld, won´t have easy at all to achieve exact focus with the standard focusing screens presently featured by the flagship 24 x 36 mm format Canon and Nikon cameras. 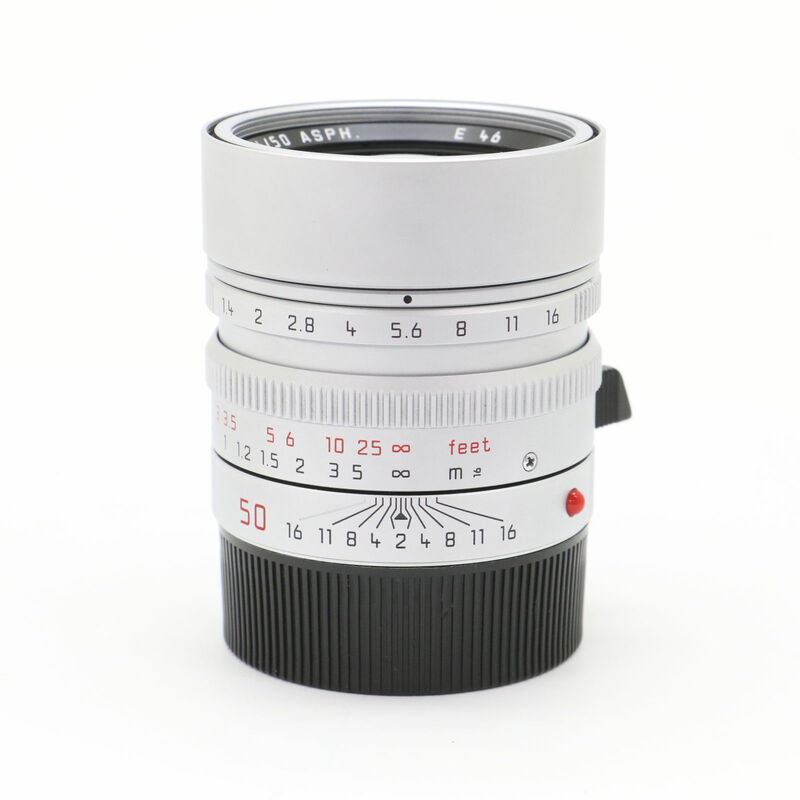 Therefore, in my opinion, the Summilux-M 50 mm f/1.4 ASPH launched into market in 2004 and designed by Peter Karbe (Head of Optics Development at Leica Camera AG and the best optical designer in the world) is from the viewpoint of designing difficulty a more commendable lens than the Zeiss Otus 55 mm f/1.4 Apo-Distagon T* (which besides, had the advantage of having been designed almost ten years later), because it is much smaller and lighter (almost three times shorter and roughly a 300% less heavy) and its designing parameters were far more exacting not only from an optical viewpoint, but also in regard to its mechanical metallic components and overall structure, to be able to insert everything inside the lens barrel in so exceedingly tiny for its maximum aperture dimensions, starting a new era beyond the extraordinary and very solid groundwork firstly fulfilled during seventies by Dr. Helmut Marx with his COMO program of optimization (improved throughout eighties and nineties by Dr. Wolfgang Vollrath, Sigrun Kammans and Michael Heiden) and Horst Schröder with his 01 Analysis Program during nineties, as well as making up an amazing optical feat in itself, since Peter Karbe managed to solve the great hindrance of getting all the optic and mechanic elements of the lens into the Summicron-M 50 mm f/2 existing mount. 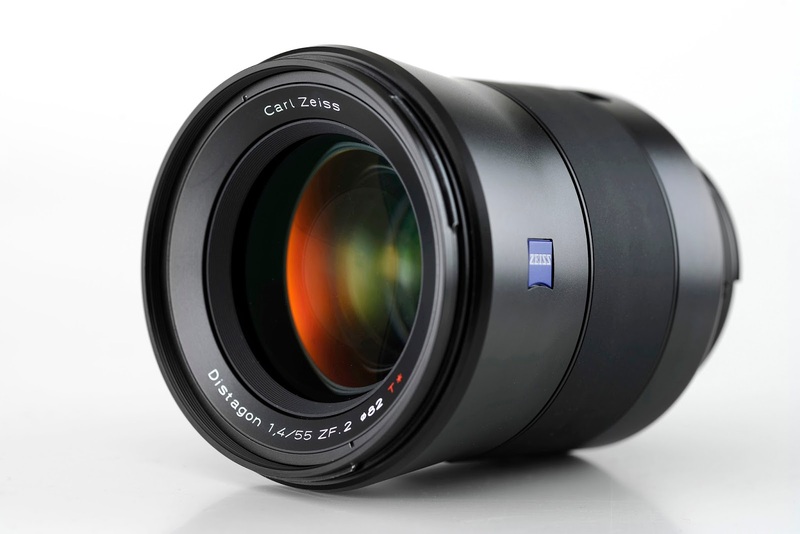 Furthermore, albeit without reaching the even more stratospheric levels in optical performance of the Zeiss Otus 55 mm f/1.4 Apo-Distagon T*, the very compact for its widest f/1.4 aperture Summilux-M 50 mm f/1.4 ASPH (whose superb image quality is at f/1.4 very similar to the one yielded by the Summicron-M 50 mm f/2 Versions 4 and 5 designed by Walter Mandler at f/2, clearly beating it in the reproduction of details on the farthest areas from image center, as well as delivering extraordinary resolving power and contrast, along with a great bokeh excelling at the beauty in out of focus areas and a remarkable smoothness in the transition between focused and unfocused zones) will be most times the lens obtaining the best image quality in uncontrolled photographic contexts shooting handheld. In addition, the Summilux-M 50 mm f/1.4 ASPH is a lens whose manufacturing stage needed a far superior level of optomechanic precision, with a movement of the focusing helicoid which had to be thoroughly coordinated with the movement of the floating helicoid, whose travel is of only 2 millimeters, and the whole mechanism had to be installed inside the lens to ensure the unmatched smoothness of the focusing ring, without forgetting the unavoidable high cost of the expensive third element of the optical formula provided by the Leitz Optical Glass Laboratory. 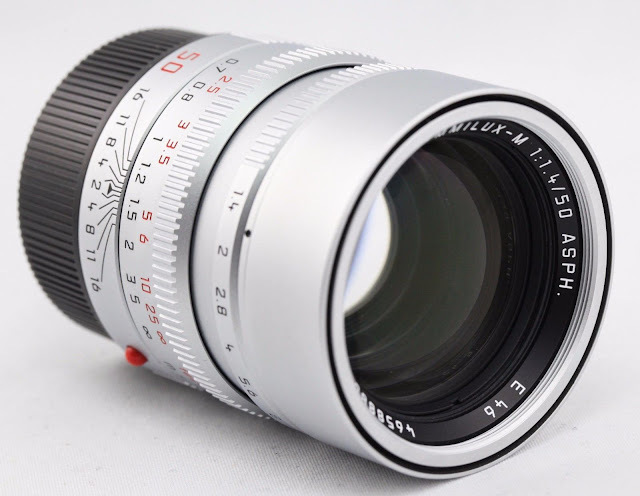 On the other hand, the design of the Summilux-M 50 mm f/1.4 ASPH had its deepest roots in the non aspherical eight elements Summilux-M 50 mm f/2 Version 6, whose prototype was created by Peter Karbe in 1989 and with which he could slightly outperform (increasing the contrast value for 40 pairs of lines/mm up to approximately a 51% at f/2 on the entire image surface, as well as simultaneously boost the optical performance in the drawing of details and nuances at such maximum aperture and solve the lack of special optical glasses boasting high refraction to attain a better correction of color chromatic aberrations, using high-end optical glasses featuring anomalous partial dispersion that he placed in the first and second elements, preserving Mandler´s configuration of the forward elements located beyond the diaphragm, while in regard to the back elements he chose the Summilux-M 35 mm f/1.4 ASPH scheme, reaching an excellent contrast value of 75% at 40 pairs of lines/mm in the image center and adjacent areas and more than a 50% on the corners, it all complemented by an outstanding colour correction, beating the mythical image quality of Walter Mandler´s Summicron-M 50 mm f/2 Version 4 (1979-1984) and Summicron-M 50 mm f/2 (1994-2013, sharing the same optical formula as its predecessor) without aspherical or floating elements whatsoever, something which was considered to be in the frontier of the impossible, albeit such as had been foreseen by the great optical designer at Leitz Midland, Ontario (Canada), such a small improvement meant a much steeper manufacturing cost and the impossibility of series production and search of a market niche, so the 8 elements non aspherical Summicron 50 mm f/2 Version 6 Project was abandoned. As a matter of fact, Walter Mandler´s top priority with its Summicron-M 50 mm f/2 Version 4 from 1979 (identical to the Version 5) had its essence in a fundamental keynote of cost effective production without losing an atom of optical and mechanical quantity, avoiding the use of the very expensive state-of-the-art LaK9 glass (which had been present in three of the elements of the Summicron-M 50 mm f/2 first version optical formula from 1953 and in four of the elements of the redesigned Summicron-M 50 mm f/2 1957 second version), replacing it with an exceedingly witty combination of flint glass elements featuring a relatively high refraction index, remarkable clarity and brilliance, low Abbe number and containing lead oxyde. Mandler managed to do it by dint of talent, huge experience, tremendous knowledge of materials and their optical properties and a vast assortment of resources of his own: he applied common radii all over the Summicron-M 50 mm f/2 1979 Version 4 lens, reducing the number of grinding and polishing tools, made identical the front and rear surfaces of the lens, in the same way as the convex external surfaces of both doublets and their inner surfaces, whose cemented mount subsequently turned into a designing advantage, significantly dropping the mechanizing and centering cost of the optical elements, as well as keeping it clear of any internal reflections, glare and flare, scoring an excellent optical performance of contrast of 40 lines/mm at 60% along the whole image surface diagonal. On the other hand, the introduction of the Summilux-M 50 mm f/1.4 ASPH in 2004 meant to all intents and purposes the evolutive peak of 48 years of immense know-how implemented by Leica in the field of aspheric technology which it began in 1966, being the first firm in the world to mass produce lenses featuring aspherical surfaces (when Gerd Bergmann and Dieter Jung could develop special machines able to grind and polish with a remarkable accuracy for the time and that were used with virtually handcrafted parameters, huge knowledge and devotion, to allow the creation by Prof. Helmut Marx of the first Noctilux-M 50 mm f/1.2 ASPH), all of which was subsequently very improved regarding the grinding and polishing of such aspheric lenses in late nineties by Stefan Dahlhaus and Michael Thomas, under the global supervision of Lothar Kölsch, Horst Schröder, Peter Karbe and Sigrun Kammans (the best team of optical designers in the whole history of photography) which set up the Center of Competence for Aspherical Technology until 2002, designing and building some lenses of the highest optical and mechanical level during nineties and the first two years of XXI Century which were approximately 20 years ahead of their time, as for example the Apo-Macro-Summicron-R 100 mm f/2, the Apo-Telyt-R 280 mm f/4 and the Vario-Elmarit-R 28-90 mm f/2.8 - 4.5 ASPH (by far the best zoom lens in the world optically and mechanically until the introduction of the Vario-Elmar-SL 24-90 f/2.8-4 ASPH for the Leica SL camera in late 2015), all of them currently being stellar performers both with film and full frame 24 x 36 mm digital sensors, which speaks volumes about the tremendous knowledge, prowess and insight that gave birth to them. 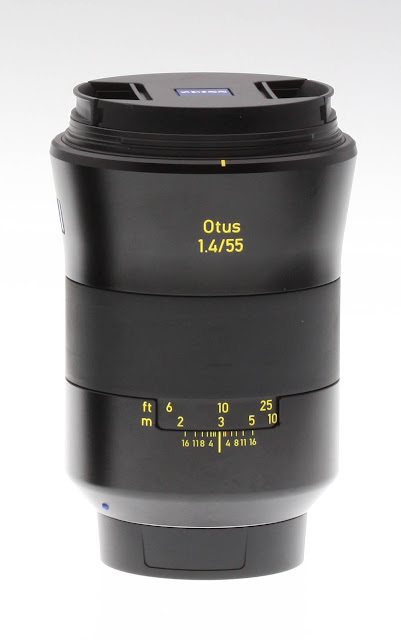 Whatever it may be, it is very clear that if a photographer works under controlled conditions and can take his/her time to do things quietly, being able to accurately focus, both in studio and outdoors, with the lens on a tripod, the Zeiss Otus 55 mm f/1.4 Apo-Distagon T* will get the best results. 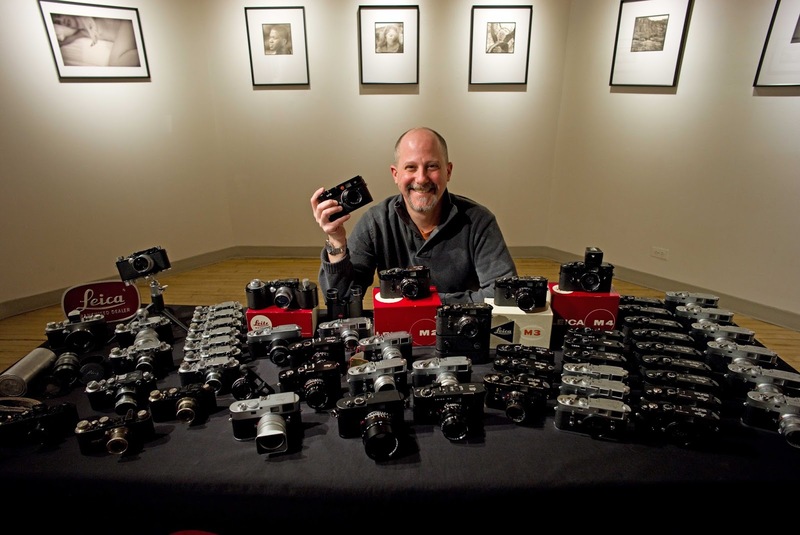 But if already the legendary world-class Leica expert Tom Abrahamsson doubted if vast majority of Leica photographers could ever use the Summilux-M 50 mm f/1.4 ASPH drawing its full stunning potential, you can imagine the fairly good technique and experience needed to obtain only the 90% potential of the Zeiss Otus f/1.4 Apo-Distagon T*, which is probably the most perfect lens designed and built hitherto for any format (along with the Leica Summilux-SL 50 mm f/1.4 ASPH, the Summarit-S 70 mm f/2.5 ASPH for Leica S, the almost limited by diffraction Rodenstock Digaron-S 23 mm f/5.6 for digital backs, 112º coverage — equivalent to a 16 mm lens in 24 x 36 mm format — , with a large image circle of 70 mm and obtaining an extraordinary image quality in center, borders and corners, with a great evenness of optical performance, even at its widest aperture, without any fall-off, with the added advantage of a flange distance length of around 45 mm enabling infinity focus with most of technical cameras and a state-of-the-art multicoating spawning an admirable light transmission, great contrast and a virtual absence of ghost and flare; the Leica Apo-Telyt-R 280 mm f/4 and the Olympus Zuiko Digital for 4/3 sensors), delivering superlative levels of contrast, sharpness and a very homogeneous illumination on the whole image surface, as evolutive pinnacle of one of the optical designs having achieved a better performance in history: the retrofocus Distagon, whose first high quality genealogical offspring were the Distagon lenses designed throughout fifties with very little help of computers. 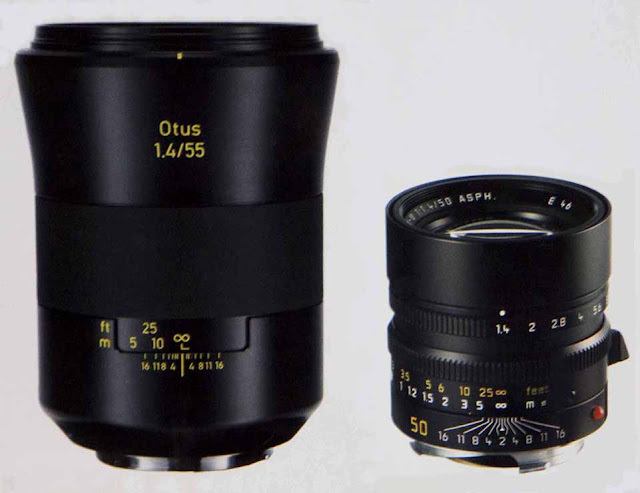 Not in vain, the Zeiss Otus 55 mm f/1.4 Apo-Distagon T* includes a significant percentage of Erhardt Glatzel´s DNA, since during sixties and seventies the great Head of Optical Design at Carl Zeiss greatly improved the optical performance of the Distagon optical scheme, both for 24 x 36 mm format and for 2 1/4 x 2 1/4 (6 x 6 cm) medium format, through a symbiosis between the use of increasingly fast and powerful computers, the specific lens designing programs and his colossal knowledge, ingenuity, intuition and all kind of resources, epitomized by such lenses as the Carl Zeiss Distagon C 60 mm f/3.5 C chromed from 1970s (which already at that time delivered very good resolving power and contrast, a laudable correction of the distortion and an excellent rendering of microcontrast), the 10 elements in 9 groups Carl Zeiss Distagon CF 60 mm f/3.5 (with a weight of 1375 g and dimensions of 125 mm length x 104 mm diameter) for 2 1/4 x 2 1/4 (6 x 6 cm) format, the 7 elements in 7 groups Carl Zeiss Distagon Cfi T* 60 mm (also for square medium format), the Carl Zeiss Distagon T* 35 mm f/1.4 for 24 x 36 mm format Contax cameras and others. Id est, with its Otus 55 mm f/1.4 Apo-Distagon T* , Zeiss opts for following a full steam exotic and uncommon way in the sphere of standard 50/55 mm f/1.4 lenses, which generally adopt Double-Gauss or partially Double-Gauss (7 elements in 5 groups — Walter Mandler´s non aspherical Summilux-M 50 mm f/1.4, which was the benchmark during 44 years, between 1960 and 2008 — , 8 elements in 5 groups — Summilux-M 50 mm f/1.4 ASPH from 2004 — , 7 elements in 6 groups — Takumar 50 mm f/1.4 Super-Multi-Coated from 1971-1972, Olympus Zuiko OM 50 mm f/1.4 Auto-S from seventies (rendering a visible presence of vignetting and a simply acceptable bokeh on focusing all of its optical formula to get very good contrast and sharpness) — , and many others. 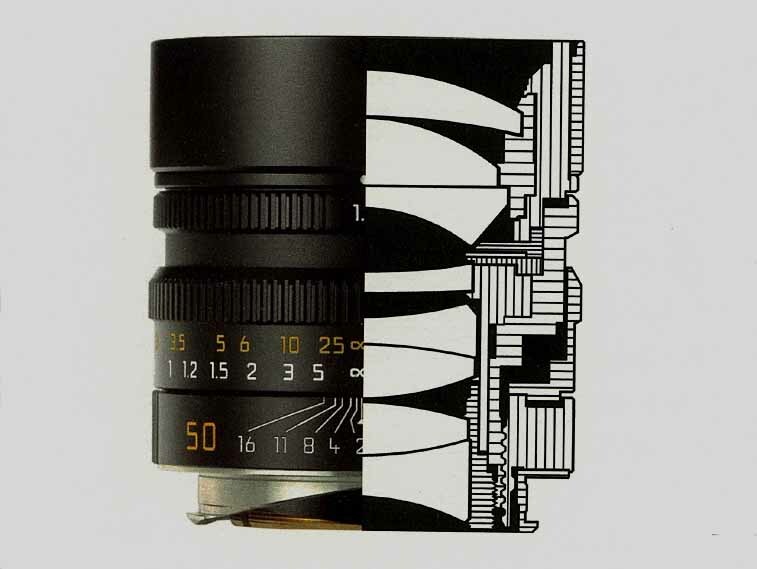 And it is highly praiseworthy, because the Double-Gauss design has been the most widespread in the whole history of photography along with Paul Rudolph´s 4 elements in 3 groups Tessar f/6.3 lens from 1902 (together with the later improvements and more luminous widest f/3.5 and f/2.8 widest apertures introduced by Ernst Wanderslab and Willy Merté) and the Rapid Rectilinear or Aplanat designed by J.H.Dallmeyer and Dr. H.A. Steinheil (whose performance was limited by astigmatism in the borders and corners of the image surface, because of the Petzval´s sum, that´s to say, its optical scheme suffered from a visible image curvature, intentionally preserved to foster its very good for the time correction of distortion and the control of aberrations in a wide range of distances) and was the most far-reaching one in XIX Century throughout 24 years, between 1866 and 1890.
a) The best Carl Zeiss Distagon lenses for both 24 x 36 mm and 2 1/4 x 2 1/4 (6 x 6 cm) format designed by the genius Erhardt Glatzel with his steadily improved Method of Adaptive Optimization in Lens Designing, using computers and specific softwares, subsequently adding his unutterable optical gift with personal touches that were the ones making a difference. It is important to keep in mind that vast majority of lenses featuring a Distagon design and created by Erhardt Glatzel (specially those ones produced for medium format) from 1960s onwards deliver such a great image quality that are very adequate for photogrammetry and aerial photography. b) The Carl Zeiss Distagon T* 35 mm f/3.5 for medium format Contax 645 camera, which gets an excellent image quality on the whole frame surface, with an amazing uniformity of optical performance between center, borders and corners at every diaphragm, together with a laudable correction of distorsion. 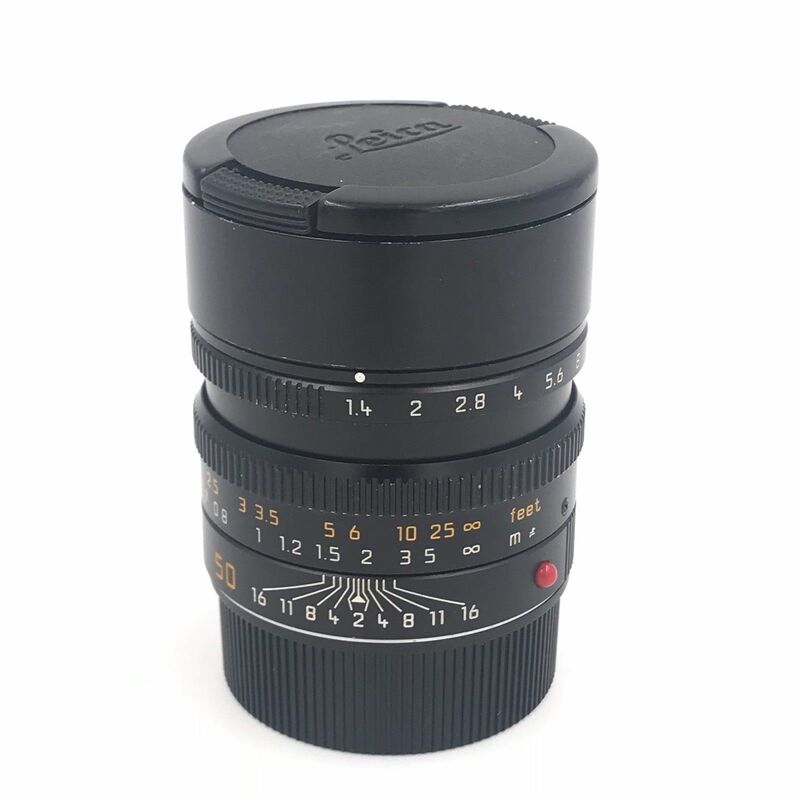 c) The Carl Zeiss T* Superachromat 250 mm f/5.6 for 2 1/4 x 2 1/4 (6 x 6 cm) medium format cameras, one of the most perfect photographic lenses ever made (almost diffraction limited — on a par in this aspect with the almost diffraction limited Leica Apo-Macro-Elmarit-R 100 mm f/2.8 — and only beaten in this regard by the diffraction limited Apo-Telyt-R 280 mm f/4), in addition to being one of the yardsticks in unique sharpness, resolving power and contrast, not needing any infrared correction whatsoever and obtaining virtually unbeatable colour precision (only outperformed in this regard by the presently reference-class levels of very high light transmission — particularly in the long light paths of the prisms —, state-of-the-art antirreflective coatings and colour neutrality achieved by the optical formula of the extraordinary Leica Noctivid binoculars designed by Michael Hartmann and with which any observer can see almost 3D, with the added benefit of a top-notch engineering accomplished by Sigrun Kammans and enabling to keep identical optomechanical qualities throughout decades of intensive use) and correction of the secondary spectrum. 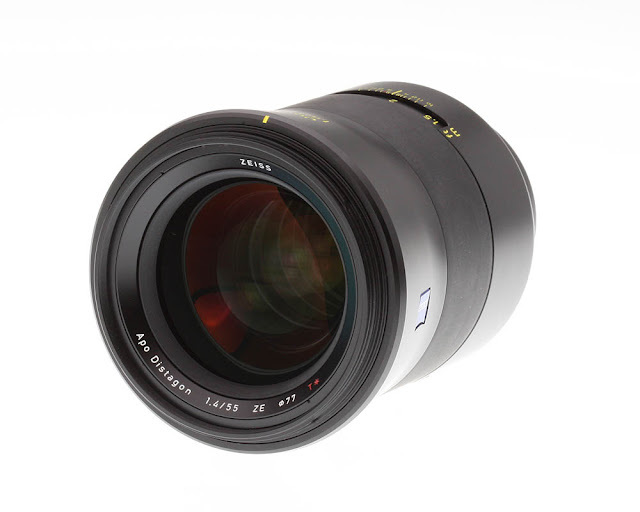 To properly understand what the Zeiss Otus 55 mm f/1.4 Apo-Distagon T* for 24 x 36 mm format has meant in the history of photographic lenses, it is also fundamental to know that it outperforms the Carl Zeiss Jena Superachromat 250 mm f/5.6 as to a truly commendable correction of the residual aberrations within the Raleygh limit of focusing uncertainty. 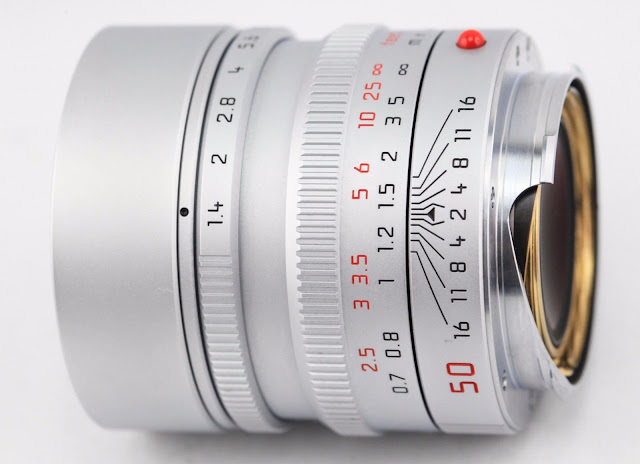 But there hasn´t been, there isn´t and there won´t be any 100% perfect lens. Each objective has got its strong and weaks points and both telecentric lenses and those ones using telecentric schemes (opposed to the symmetrical designs in whcih their exit pupils are near the image plane) in specific groups of their optical formula, will have to feature a very large size and weight, with huge bayonet diameters, such as happens with the Zeiss Otus 55 mm f/1,4 Apo-Distagon T*, a lens in which Zeiss has put all of its optical expertise of more than one century in the creation of a no compromise lens delivering an impressive sharpness on the whole image surface at every diaphragm and focusing distance, a remarkable absence of coma, a reduction of the longitudinal chromatic aberration to negligible levels, a reference-class flatness of the image field, a focusing ring boasting silky smoothness, state-of-the-art engineering and mechanical construction, an almost unbeatable bokeh in the realm of standard 50/55 mm f/1.4 lenses (in my opinion only very slightly beaten in this regard by the Minolta MC Rokkor 58 mm f/1.2 and the Noctilux-M 50 mm f/1), an exceedingly complex optomechanic design with massive use of bearings, a real and exceptional apochromatic design correcting the three colours of the light (red, green and blue) focusing each one on the same point to avoid colour fringing, a staggering uniformity of optical performance at the highest level between center, borders and corners, a top-notch correction of distortion (reducing it to almost zero regarding pincushion one and approximately 0.80% in barrel going unnoticed to practical effects on watching the images). As a matter of fact, both the Otus 55 mm f/1.4 Apo-Distagon T* and the Leica Summilux-SL 50 mm f/1.4 ASPH have inaugurated a new era in the history of photographic lenses, accomplishing something unthinkable only ten years ago: a resolving power beginning to approach to the area between the Rayleigh limit and the theoretically impossible to transcend Werner Heisenberg´s Uncertainty Principle. There were already some techniques to attain super resolution beyond the Rayleigh limit in the scope of reference-class microscopes, but the tremendous optical knowledge, proven substantial experience, deep grasp on the properties of optical glases, mastery in the location and configuration of the optical elements and groups along with the interaction between them, perseverance and a myriad of tricks of their own used by both the designer of the Zeiss Otus 55 mm f/1.4 Apo-Distagon T* and the designer of the Leica Summilux-SL 50 mm f/1.4 ASPH have been truly colossal with these two photographic lenses for 24 x 36 mm format cameras, having fought to their utmost with the diffraction limit implying that optical resolution is limited by the light wavelength and the concept that the resolving power of an optical system depends on the bandwidth of the spatial frequencies that are collected by it. 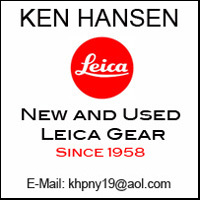 And of course, both highly luminous lenses approach very much to quantically feasible limit reagrding resoloving power, with the best state-of-the art technology currently available in the world, but above with immense optical talent and passion for photography. Definitely, both the Zeiss Otus 55 mm f/1.4 Apo-Distagon T* and the Summilux-SL 50 mm f/1.4 ASPH do confirm that no optical designing software or computer program can create by themselves a lens boasting such formidable optomechanical qualities, and the most decisive factor at this stratospheric level will always be the know-how, prowess and intuition displayed by the optical designer, who must guide the designing software towards the right direction, something of extreme difficulty, particularly in highly luminous benchmark lenses like the Zeiss Otus 55 mm f/1.4 Apo-Distagon T* and the Summilux-SL 55 mm f/1.4 ASPH, in which as well as fulfilling a hugely praiseworthy correction of the different chromatic aberrations, they had to control more than fifty dimensional mathematic spaces. But the extraordinary potential of this lens (which will above all excel in controlled environments both indoors — particularly in studio — and outdoors) isn´t at all easy to attain shooting handheld, because it is a very bulky and heavy manual focusing lens, with a weight of one kg and very large size, so excellent very luminous smaller and lighter lenses (in spite of being light years behind the stratospheric Zeiss Otus 55 mm f/1.4 Distagon T* from an optomechanical viewpoint ) like the 470 g Noct-Nikkor 58 mm f/1.2, the 205 g Takumar 55 mm f/1.8 Super-Multi-Coated and the Summilux-R 50 mm f/1.4 Version from 1967 will get much more consistent results than the Otus 55 mm f/1.4 from the standpoint of focusing accuracy, stability and image quality achieved in a very significant percentage of the pictures. 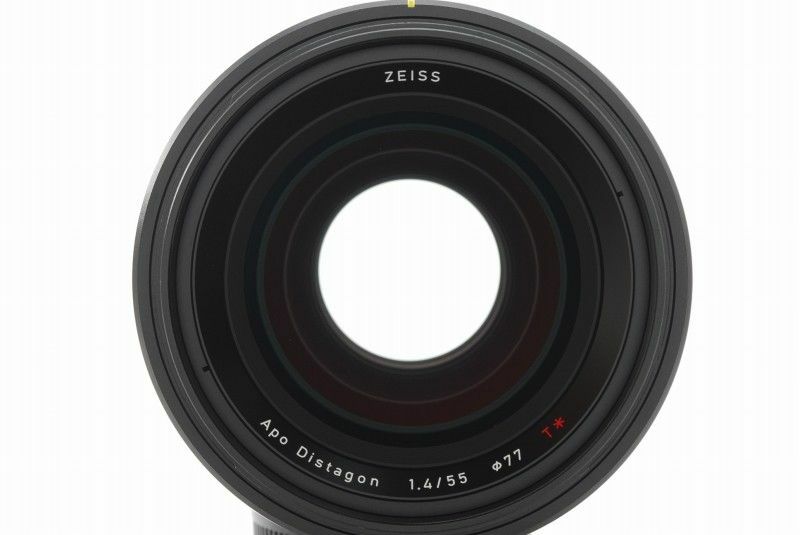 The upshot of it is that the focusing precision is something of great relevance for the final image quality obtained by any camera/lens binomium and an absolutely essential factor to draw as much potential as possible of the Zeiss Otus 55 mm f/1.4 Apo-Distagon T*, the flagship among the large aperture f/1.4 standard lenses along the Leica Summilux-SL 50 mm f/1.4 ASPH and the Summilux-M 50 mm f/1.4 ASPH, which play in another league in comparison to the rest of standard 50 mm f/1.4 lenses of the photographic market. 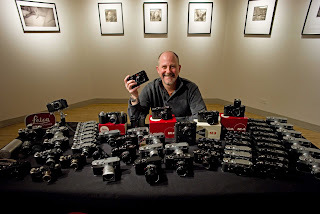 Peter Karbe, the best optical designer in the world and creator of the Summilux-M 50 mm f/1.4 ASPH boasting a very small size and exceedingly low weight for its widest f/1.4 aperture, a full-fledged technological, optical and mechanical tour de force accomplished in 2004 by the Head of Optics Development at Leica Camera AG. 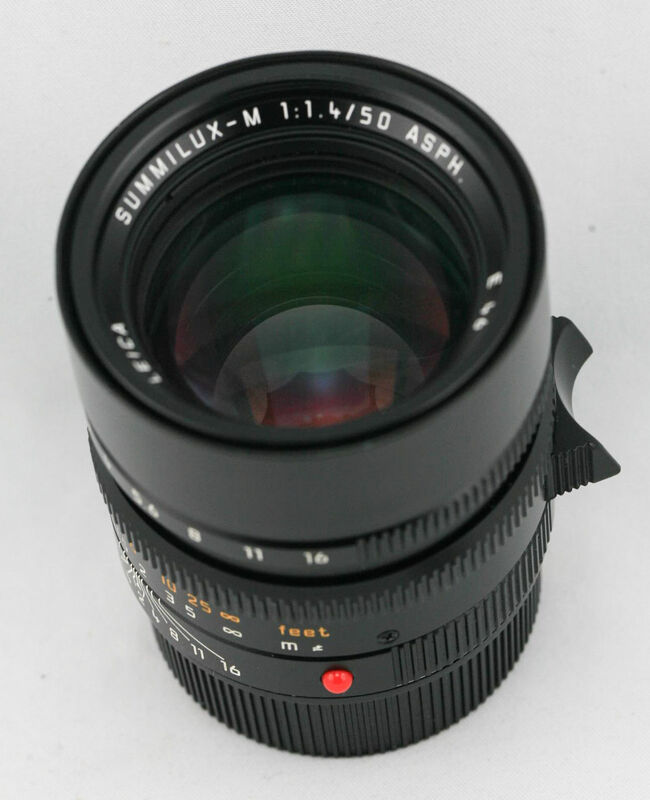 Therefore, the Summilux-M 50 mm f/1.4 ASPH is at the moment the best third lens in the world in its focal length and luminosity in regard to image quality achieved, but its compact size and light weight (335 g) for its widest f/1.4 aperture (almost three times smaller and less heavy than the Zeiss Otus 55 mm f/1.4 Apo-Distagon T* and than the Leica Summilux-SL 50 mm f/1.4 ASPH ) turn it into a formidable photographic tool through the adequate adapters to shoot handheld in a wide range of contexts, particularly in symbiosis with the fabulous digital sensors of professional mirrorless 24 x 36 mm format cameras like the Sony Alpha 7, Alpha 7 II, Alpha 7R, Alpha 7S, Alpha 7RS, Alpha 7RIII (together with other ones featuring APS-C format like the Fujifilm X-Pro 1, X-Pro 2, XT-1, XT-2, X100F, X-T20, XH-1, X-E3, X-A10, etc, and Micro Four Thirds format like the Olympus OM-D E-M10 Mark III, EP M1, EP M2, Panasonic Lumix DC-GH5S, DCGH5L, DCGH5M, DCGH5, DCGH5A, DCGH5LGA, DCM-GH4AGC, DMC-GH4GC, etc), with amazing levels of stability and comfort, attaining very high rates of perfectly focused pictures with extraordinary image quality, something also happening with the unbeatable in compactness Summicron-M 50 mm f/2 Versions 4 and 5 (195 g), whose potential of optomechanical performance (in the same way as with the Summilux-M 50 mm f/1.4 ASPH) won´t be reached by most photographers, because one thing are the MTF charts, lines/mm graphs, interferometers working with helium-neon laser, the optical designing softwares, etc, and another one the very comprehensive range of real photographic situations.